Although they all serve the same purpose—to keep water in the bathtub when desired and allow the tub to be emptied again—there are several different styles of bathtub drain stoppers. Identifying what type you have will help you when it becomes necessary to fix or replace your drain stopper. Some kinds of drain stoppers can make it rather tricky to routinely clean out the drain of hair and debris. Here are the six most common types of bathtub drain stoppers. 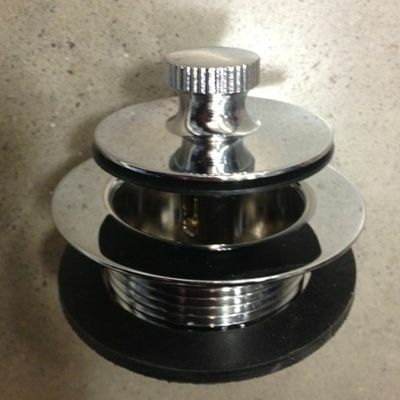 A lift-and-turn drain stopper is identified by a small knob on the cap of the drain stopper, which is used to twist the stopper open and closed. A lift-and-turn stopper is closed by turning the knob on the top of the stopper until it goes down, and it is opened by lifting and turning the knob in the opposite direction. This type of stopper is installed by screwing a center setscrew into the threaded center of the drain cross bar. The setscrew is found beneath the top cap of the stopper. Removing a lift and turn stopper can be a little tricky if it was overtightened when first installed or if it hasn’t been removed in some time. But mechanically, this is a very simple design that rarely needs much attention, other than occasionally removing the plug to rid the drain of hair and debris. A push and pull stopper is very similar to a lift and turn stopper in design and look, but it is pushed down to close and pulled up to open rather than twisting to open and close. Installation is also similar, with the stopper body attached to the drain with a setscrew found under the cap of the stopper. This also is a very simple mechanical design that rarely requires much in the way of repair. A toe touch stopper (also called a toe tap or foot actuated) is closely related to the lift-and-turn and the push-and-pull stopper. This type uses a spring-loaded design, and the stopper body is held in place to the cross-bar on the drain fitting via a screw found underneath the cap of the stopper. To close or open the stopper you just push it down with your toe. Like the preceding stopper types, this one is relatively trouble-free, though sometimes the spring mechanism may wear out, requiring that you replace the stopper. A flip-it tub stopper is easily installed with no tools required. A toggle lever attached right to the top of the stopper is moved from side to side to close and open the stopper. To install this type of stopper, you just push it into the drain; the ​built-in O-rings hold it in place and make a watertight seal. The trip lever stopper is one of two types featuring a lever found on the overflow plate at the front of the tub. In this first type, there is no visible pop-up stopper in the drain opening—just a strainer. This stopper operates by means of a plunger in the tub overflow pipe, which moves up and down to close and open the tub's drain pipe. The plunger is connected to the trip lever by means of a connecting rod found inside the overflow tube. With the trip lever down, the plunger is lifted up and the drain is open; when the trip lever is up, the plunger is forced down and the drain is closed. This stopper type is somewhat tricky to remove for cleaning, as it must be extracted by pulling it up through the overflow tube and out of the overflow plate. A variation of the type does not use a lever, but rather a twist cover on the overflow plate that rotates left and right to raise and lower the plunger. The drain part of this type of tub stopper looks very much like a bathroom sink pop-up. And it is similar to the trip-lever stopper, since it is operated by the same type of lever on the overflow plate. When the lever moves, the connecting rod linkage in the overflow drain pipe moves also and pivots a rocker arm that connects to the pop-up stopper. At the bottom end of the connecting rod is a spring that presses down against the rocker arm to operate the stopper. This stopper type can also be a little complicated to clean, since the stopper and rocker arm must be extracted through the drain opening, and the connecting rod linkage must be extracted up through the overflow pipe and out through the overflow plate. The complexity of the mechanism makes this stopper type more susceptible to collecting hair and debris.